The origin of the festival’s name is twofold, Holladay explains. The organizers chose it both to honor Orange County, Indiana, folk musician Quinten “Lotus” Dickey and because the lotus flower, which grows in many countries and is an important symbol in various cultures, reflects the international ethos of the festival. “He was an inspiration, but they also loved the idea that the lotus flower grows everywhere in the world,” Holladay says. From its modest beginnings 25 years ago, the Lotus Festival has become one of the city’s premier cultural events, bringing about 12,000 people to downtown Bloomington each fall. 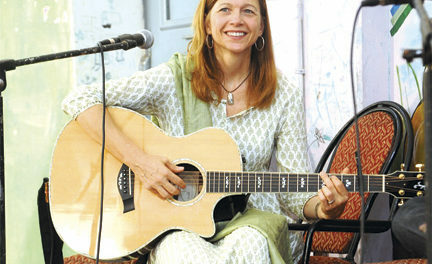 The festival lasts four to five days and features a roster of 25 to 30 solo artists and groups. The diverse musical offerings—from Portuguese fado and Buddhist chant to Afro-Venezuelan parranda and Yiddish folk songs—allow audiences to experience live world music without ever leaving home. The festival also includes visual arts components and free “Lotus in the Park” events with concerts, workshops, and exhibits. Over the years, Lotus has grown in size and scope, and it’s also evolved into a nonprofit organization with a year-round presence. In 1995, the Lotus Education & Arts Foundation was formed with the mission of providing opportunities to experience, celebrate, and explore diverse cultures through music and the arts. The festival is its flagship event, but the nonprofit also offers educational programming such as Lotus Blossoms, which brings performers to K–12 classrooms throughout south-central Indiana, and visual arts programming. Though much about the Lotus Festival has changed since 1994, it is still held in downtown Bloomington. The festival’s location in the heart of the city is central to its identity, Fass says. The 25th annual Lotus Festival takes place September 27–30.